The number of workplace deaths this year has hit 32, six more than in the same period last year. The latest took place yesterday, bringing to four the number of fatalities after stiffer penalties for employers with safety lapses came into force two weeks ago. A man in his 50s died at his workplace in Kee Seng Street, a day after a 23-year-old construction worker was killed by a falling steel truss. The prevalence of workplace fatalities has prompted the authorities to raise penalties for offenders, but observers say much more needs to be done to step up safe work practices and prevent further deaths. "We are deeply concerned with the recent spate of fatalities," Minister of State for Manpower Sam Tan told The Straits Times yesterday. "We will continue to take strong enforcement actions against errant employers and will prosecute those who are found liable for the accidents. We call on employers and workers to work together to take all measures to prevent further workplace accidents." The Manpower Ministry (MOM) announced on May 12 that it would raise the minimum time for companies ordered to stop work, from two to three weeks. Companies also risk being deprived of new foreign workers until they have resolved safety issues. The Singapore Contractors Association hit back at the move a week later, saying the stiffer penalties would worsen the "dire situation for meeting deadlines and financial penalties" for errant companies. 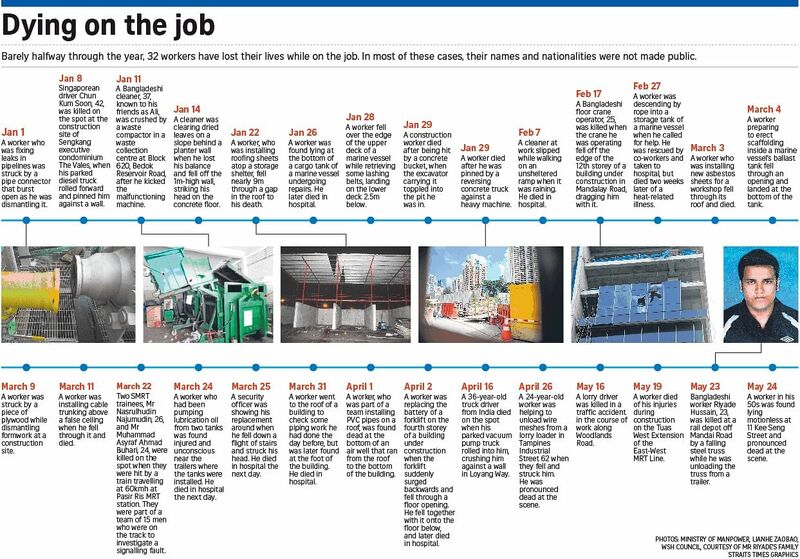 Yesterday, its executive director, Mr Lam Kong Hong, stuck to his position, calling for preventive rather than punitive measures: "A longer stop-work order could aggravate the contractor's inability to meet a deadline, and it might have to rush the job even more. That would impose a potentially higher risk." He also said workers might suffer a pay cut with a longer stop-work order, as they cannot clock overtime. Two labour MPs said the spate of workplace fatalities was a "worrying trend", but said draconian measures alone would not work. West Coast GRC MP Patrick Tay, who chairs the Government Parliamentary Committee (GPC) for Manpower, said human error was a key cause of these fatalities. "It could be mere carelessness or fatigue, or it could be negligence and complacency," he said. "A company can have many standard operating procedures but it boils down to every single worker." Pasir Ris-Punggol GRC MP Zainal Sapari, the GPC's deputy chairman, called for the training quality for safety officers to be enhanced. "While you can engender a safety culture among your own workers, you also need to ensure you engage your subcontractors in systems, structures and processes that promote work safety," he added. Singapore Institution of Safety Officers president Bernard Soh said it was all very well for company management to commit to better safety, but often this did not trickle down to the workers. Safety bulletins put up at sites can be too wordy, he said. "I don't think the worker would understand everything even if he knows a bit of English. Safety officers need to translate things to workers at team meetings, in bite-size pieces of information," he said. Safety officers said they are stepping up efforts in the wake of the recent deaths and tougher measures. Vigcon Construction safety officer Mohammad Hidayat Hamzah said it has increased worksite safety inspections from once to twice a week, and doubled the number of officers doing checks. Advocacy groups for foreign workers, who form the bulk of construction and marine workers here, said more has to be done to regulate working conditions. Humanitarian Organisation for Migration Economics (Home) executive director Jolovan Wham said fatigue played a significant but underrated role. "If you have to work 12 hours or more every day, seven days a week, no matter how careful you are, you will make mistakes, lapses will occur, and accidents will happen." He added that workers were reluctant to speak out against safety lapses as it might cost them their jobs. Workers interviewed were not aware of the rise in fatalities, but were concerned about accidents. Said Indian national Palanimuthu Palaivalathan, 31: "If we get injured, we can't work and the company won't give us our salary." Bangladeshi electrical worker Md Ontu Islam, 27, said: "When accidents happen, sometimes it's the worker, sometimes it's the site, sometimes boss pushes too hard." But no worker wants to be hurt. "If I get injured, how can I give my family money?" said Mr Ontu. "This is what every worker thinks. Everyone thinks of safety."